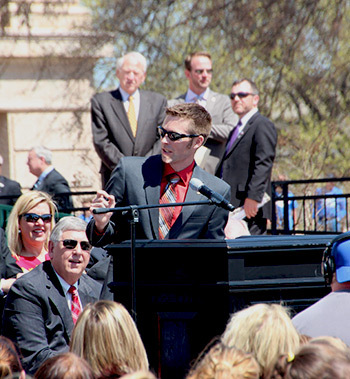 On Monday, March 30, I had the privilege of speaking at the education rally held on the steps of the State Capitol. I would like to share my remarks with you. Good afternoon my fellow educators. I am honored to stand before you today not only as Oklahoma’s ambassador for education, but also as your peer as we join together to fight for the profession we all love and the students we are all called to serve. I teach at Tahlequah High School, and in the Tahlequah Public School district our motto is “Tigers ROAR.” The ROAR stands for Removing Obstacles and Achieving Results. I stand before you today and argue that while a tiger may roar, no one can ROAR quite like a teacher. Over the last five months I have traveled over 10,000 miles crisscrossing our state encouraging prospective teachers, visiting districts and classrooms, all in a pursuit to gain a clear perspective of the state of education within Oklahoma. I have witnessed firsthand just how you each ROAR. Teachers across our state daily remove obstacles and, through love, meet the most basic needs of their students. Oklahoma teachers today are faced with numerous barriers, such as excessive testing requirements and a lack of funding that have added to a teacher shortage approaching crisis levels. And yet, like our state motto, “Labor conquers all things,” Oklahoma teachers achieve results. I have come to the conclusion that even though Oklahoma may be in the midst of a teacher shortage, there is no shortage of great teachers in Oklahoma. Our roar as a profession is being heard today, but the challenge will be making sure that it carries on from this day forward. All great teachers know that our effectiveness is rooted in the relationships with our students. We are in the business of building people. That takes a special heart — a teacher heart — which has its roots in servanthood. We can no longer stand idly by and let those who lack that sort of heart tell our story. That heart is what makes us who we are, and only that heart can accurately tell our story. So be bold, my friends, and let the ROAR in your heart be heard.